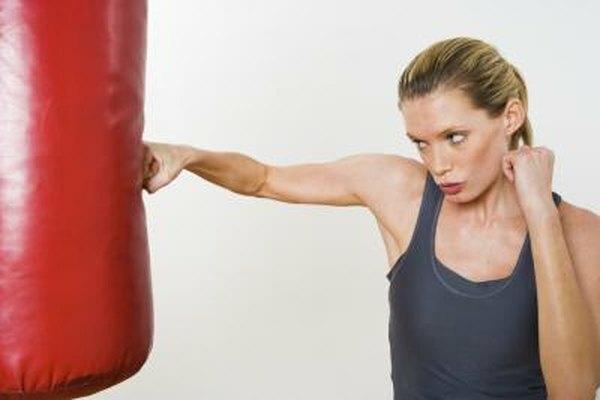 Although punching a heavy bag certainly will exercise your arms, it may come as a surprise that they aren't the only -- or even the most important -- muscles engaged when you throw a punch with good form. A strong punch is less about reaching for a target with your hand, and more about pushing your hand forward with your body. Your triceps, the group of three muscles on the back of your upper arm, extend your arm and drive you forward. These engage in two ways when you punch a bag. As you extend your arm, they are responsible for the extension. When the punch lands, they engage to keep your arm solid against the resistance of the bag. Your wrist and forearm contain a collection of different muscles: the flexor carpis, flexor digitorum, palmaris longus, pronator teres and brachioradialis. When a punch lands, these muscles engage to keep your wrist straight and to absorb the impact of the punch. Without their engagement, your punches would twist, buckle and potentially strain your wrist. Much of the power in a punch comes not from your arm, but from the larger muscles of your shoulder and chest. These include the pectoral muscles, deltoid and trapezius muscles. When you punch, think of these muscles as the motor that drives forward the piston that is your arm. The large slab of muscle in your upper back called the latissimus dorsi engages to provide even more power to a punch -- especially to circular punches such as a hook or uppercut. As with the triceps, this muscle engages both to push your punch forward and again to absorb the impact of the landing blow. The degree to which you rotate your core to drive a punch is, in large part, the degree to which your punch lands with real force. Rotating at the core puts the majority of your body weight behind the blow. The muscles here include the abdominals, abdominal obliques and erector spinae. Not every punch involves and engages these muscles -- just every good punch.